At the end of May we paid a visit to Granada, a city that I like more and more each time I go. This trip we were staying overnight so leaving home in Jaen province fairly early we left our car in a central car park, took a taxi and were having second breakfast (hubby’s choice) next to the River Darro by 11am, very civilised indeed. At 12pm we headed to the Hammam Baths just over the river for a session of pampering. Moorish design, low lights, fabulous tiles and background music all set the scene to transport you back into the Moorish era. Between horseshoe arches, mint tea, a sauna and the succession of hot, warm and cold baths it’s hard not to unwind. Peace reigns. To finish our time we had a super relaxing massage and left feeling ready to face our day of sightseeing. Thinking about it now we should have done the walking and sightseing first then have a Hammam and massage to end the day. Next time. Just down the road we lunched at La Cueva a decent restaurant with a good choice and decent wine list. Then a stroll around the Moorish quarter of the Albaicin followed by a teashop visit with a menu of teas making it very hard to decide. We then went to our lovely little hotel Posada de Quijada which is up the windy cobbled back streets, which is where I choose and why we had only brought rucksacks. A charming hotel with only six rooms around a central patio where we had an early breakfast in very pleasant temperature. When we checked in the girl noticed it was my birthday and left a bottle of cava, some tiny peaches and a birthday card on our bed. I was impressed. We walked back down to the River and Le Chien Andalou where we’d booked a front row table for a Flamenco Show. I adore live Flamenco. It was good. Very good. After sampling some more wine we found our hotel again without too much difficulty! The next day having been inside the Alhambra before we chose to take the bus up to the main gate and wander back down to town via the outside walls. A lovely shady, plant-filled path snaking it’s way around the walls with views of the palace and back onto the River Darro at the far end in what I think is called Paseo de las Tristes. As we wandered along the river strains of guitar music called us to a young man with a huge smile playing some incredibly beautiful classical piece. It was time to sit and have the first beer of the day serenaded by skillful playing. Further along the riverside we again heard a guitar and through the dappled trees on the other side saw a man on a tiny metal-railed balcony head down, finger-picking the strings so intently we automatically stopped, mesmerized. When he finished he looking up, saw us and nodded to a basket on our side of the river. We added to his collection while wondering how safe it was there. A very pleasant, music-enjoyed, wine-mellowed, relaxed moments two days. It felt longer. We’d packed our time in Granda with many memories and a longing to return. On our previous visit we stayed at the lovely Hotel Boutique Gar Anat. 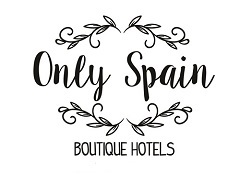 See it on Only Spain Boutique Hotels where I’ll soon be adding the Posada de Quijada too. Did you see the 36 Hours in Cordoba post?